Last year, The Daily Galaxy reported on China's eventual goal to extract Helium 3 from the Moon. The Wikileaks extracts shown below show that China's Earth-bound efforts in advanced esoteric science are equally impressive, ranging from nuclear fusion as a sustainable means to produce energy to quantum teleportation. Teleportation has long been a cornerstone of countless science-fiction novels, movies and television series. The scientific reality of teleportation (image left), Star Trek notwithstanding, is a long way off. Until recently it had been considered an impossibility, but with the advent of quantum teleportation this is starting to change, though slowly. Ouyang Ziyuan, head of China's first phase of lunar exploration, was quoted on government-sanctioned news site ChinaNews.com describing plans to collect three dimensional images of the Moon for future mining of Helium 3: "There are altogether 15 tons of helium-3 on Earth, while on the Moon, the total amount of Helium-3 can reach one to five million tons." "Helium-3 is considered as a long-term, stable, safe, clean and cheap material for human beings to get nuclear energy through controllable nuclear fusion experiments," Ziyuan added. "If we human beings can finally use such energy material to generate electricity, then China might need 10 tons of helium-3 every year and in the world, about 100 tons of helium-3 will be needed every year." Helium 3 fusion energy – classic Buck Rogers propulsion system- may be the key to future space exploration and settlement, requiring less radioactive shielding, lightening the load. Scientists estimate there are about one million tons of helium 3 on the moon, enough to power the world for thousands of years. The equivalent of a single space shuttle load or roughly 25 tons could supply the entire United States' energy needs for a year. 1. (SBU) Summary: In response to an invitation by the Chinese Academy of Sciences (CAS), ESTH officer traveled to Hefei, Anhui Province, in December 2009 to visit several Chinese government-sponsored scientific institutions. During this time, ESTH officer learned of the below information through official presentations, personal observation, and informal/discreet conversations with CAS staff members. Most significantly, the Institute of Plasma Physics continues to conduct research on how to use nuclear fusion as a sustainable means to produce energy. At the same time, China is expanding its use of nuclear fission as an energy source and plans to open at least 70 nuclear fission power Qnts within the next 10 years. In 2009, CAS’s Institute of Plasma Physics budget was USD$20 million. Additionally, other CAS institutes are conducting research in biometrics, computational physics and material science, nanoscience and nanomaterials, soft-matter physics, environmental spectrometry, fiber optic wave-length division multiplexing, quantum communications, superconductors and spintroncis, and cognitive sciences. End Summary. ¶2. (C) In mid-December 2009, the Chinese Academy of Science (CAS) Institute of Plasma Physics (IPP) in Hefei, Anhui Province was preparing for another cycle of experiments with its Experimental Advanced Superconducting Tokamak (EAST). EAST was designed to be a controlled nuclear fusion tokamark reactor with superconductive toroidal and poloidal field magnets and a D-shaped cross-section. One of the experimental goals of this device was to prove that a nuclear fusion reaction can be sustained indefinitely, at high enough temperatures, to produce energy in a cost-effective way. In 2009, IIP successfully maintained a 10 million degree Celsius plasma nuclear fusion reaction for 400 seconds. IIP also successfully maintained a 100 million degree Celsius plasma nuclear fusion reaction for 60 seconds. One of IIP’s immediate goals is now to maintain a 100 million degree Celsius plasma nuclear fusion reaction for over 400 seconds. Currently, IIP is also conducting research into hybrid fusion-fission nuclear reactors that may be able to sustain nuclear reactions indefinitely, and at sufficient temperatures, to cost-effectively produce energy. IIP officials stated that China has the explicit goal of building at least 70 nuclear fission power plants within the next 10 years. IIP scientists claimed current Chinese nuclear energy production efforts use Uranium 235, but research is being done to make Uranium 238 a feasible alternative. IIP’s 2009 budget was USD$20 million – a two-fold increase over the previous year – and IIP leadership expects their budget to increase again in 2010. Roughly one-third of IIP’s budget comes from China’s National Development and Reform Commission (NDRC); another one-third of the budget comes directly from CAS, and the final one-third comes from China’s Ministry of Science and Technology (MOST). According to IIP leadership, NDRC has been very laissez-faire in its oversight, but MOST tends to micromanage projects and the expenditure of money. (COMMENT: Based on personal/discreet conversations with IIP staff members, the relationship between CAS and MOST is strained due to officious and annoying oversight insisted upon by MOST. IIP scientists much prefer the NDRC management style and wish more of their funding could come from this body rather than MOST. END COMMENT) IIP has roughly 450 full-time staff members, over 400 graduate students, and approximately 100 contractors under its purview. BEIJING 00000263 002.4 OF 002 biometrics data on individuals covertly without their knowledge. When questioned about the device’s potential applications, IIM officials stated the device was being used by “secret” customers and was not available on the commercial market. IIM also said they were involved with China’s “Program 863.” (COMMENT: Program 863 is China’s national high-technology development plan that includes both military and civilian technology development programs; therefore, it is likely the People’s Liberation Army (PLA) is one of the customers for whom this biometrics device was developed. ¶4. (C) In mid-December 2009, the Chinese Academy of Science (CAS) Institute of Solid State Physics (ISSP) in Hefei was conducting research in the fields of computational physics and material science, nanomaterials, and soft-matter physics. ISSP’s 2009 budget was roughly $6 million (USD). ISSP’s top priority projects are: one-dimensional nanomaterials, spin and charge research using perovskite manganese oxides, and the design and preparation of high-dampening materials. ISSP also conducts research on nanomaterials and nanostructures for China’s “Program 973.” (NOTE: Program 973 is China’s national plan for improving basic scientific research and development. ¶5. (C) In mid-December 2009, the Chinese Academy of Science (CAS) Institute of Optics and Fine Mechanics (IOFM) in Hefei was modifying environmental spectrometry technology to detect TATP explosives for use in counter-terrorism efforts. IOFM was also conducting fiber optic research on wave-length division multiplexing (WDM) technologies using pulsed and continuous laser sources at both single-mode and multi-mode wavelengths. A cursory walk through one of their labs revealed that IOFM was specifically conducting experiments in the 980-1150 nanometer range, and that they were conducting experiments using hydrogen-filled fiber optic communication lines. (COMMENT: Hydrogen-filled fiber optic lines are technologically challenging to manufacture, but provide many advantages; one of which is increased security and protection from tampering. rying to conduct dual-particle quantum teleportation. Image top of page: The New China Science and Technology Museum in Beijing. 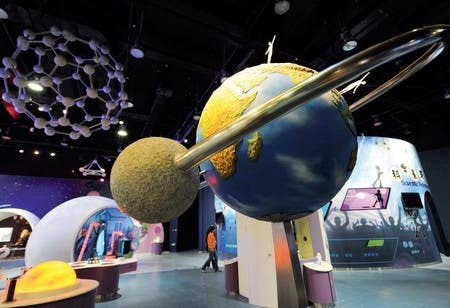 The new museum presents a modern approach to science and technology with distinctive themes and state-of-the-art technology.